Get those precious memories off your digital camera and into your life! 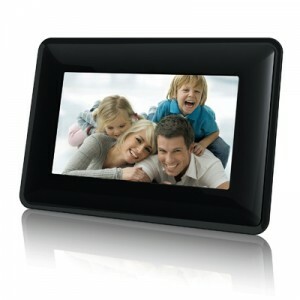 This 7-inch TFT LCD digital photo frame makes it easy to enjoy your favorite digital pictures without a computer! This stylish BLK-7IN-DPF digital photo frame features a built-in card reader that lets you enjoy thousands of images on its 7-inch LCD screen! Make your life better. The item of 7-inch TFT LCD digital photo frame offer you a more convenient way to show off the precious memories of your everyday life, pictures can be shown clearly on the 7″ 480×234 TFT LCD, the 7-inch TFT LCD digital photo frame has a Built-in 3-in-1 Card Reader and it supports USB flash drives, you can use it just as easy as a digital player.